We had a speed test thread a few years back, well now you can go further and test not just your speed but your line quality. ____ I so wanted to see how bad our connection was but I had to download Java, that was going to take two hours. So I just have to guess that our ping would be also. * they talk to well known servers which are often latency close to the user, or otherwise well connected. * they don't simulate actual browser traffic at all. Most use one stream up or down at a time. Modern browsers open 4 streams per domain, and most sites split their content to many domains to get a further boost. Doing less than 10-15 streams at a time to different end points does not result in a realistic scenario. * packet loss is generally always 0, until you look at specific destination hosts. When an ISP is tampering with your connection, all it takes is one errant malicious packet in the middle of a long stream to make it a futile experience. Try uploading images to picassa from some hotels (or anywhere in China). You get part way through the upload and then the connection is reset. This, BTW, is one of the several ways in which the Great Firewall works. 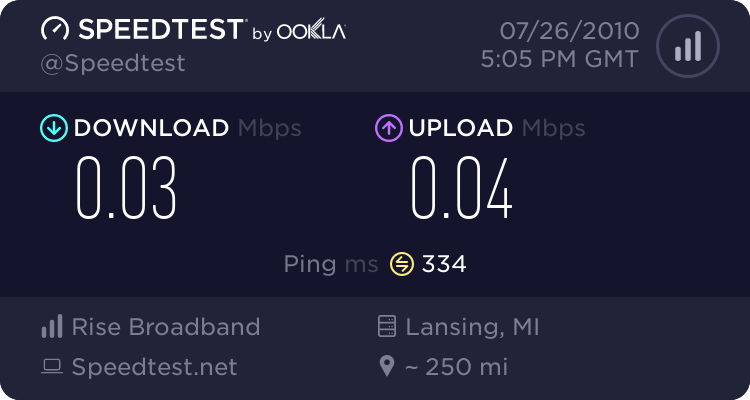 interesting, because my meaningless munbers are teh lowest, and I thought I have a really poor cable connection. (I even got someone at the company to finally tell me this is why I was having problems.) I have a cable modem and my house is really at the distance limit. To put that number in perspective, You can ping your ISP about six times a second. I can ping my ISP about 67 times a second. still no idea what the absolute meaing is. Judging your connection by comparing ping time is about as useful as judging your CPU by comparing BogoMIPS. Ping and jitter measurements are useful for diagnosing problems with VOIP, online PVP gaming and other application where high latency is problematic. For most internet applications, however, latency doesn't matter very much. Beyond that, it's just another way to compare e-peens. Not at all. For web browsing, latency is the most critical factor in user perceived responsiveness. For bit-torrent, latency or jitter does not matter. For VOIP, jitter matters most. For gaming, everything matters, but the most important factor is latency to your game server, rather than any traffic shaping the ISP is doing. My meaningless numbers are surprisingly good for VoIP, apparently. Maybe a side-effect of Time Warner piping their digital phone over the same physical wire as the internet service. And that is why I never use YouTube on this computer. Rohnwyyn: If I had those numbers from Comcast Cable Internet, I'd be complaining to them, a LOT. I have cheap -- very cheap -- DSL from AT&T, I don't expect a lot from it, but I also pay <$20/mo. for the service. When I had Comcast Internet I paid >$60/mo. and it was blazing fast. If you're paying anything near to what I was paying for your Internet, please call and complain... and keep complaining until they actually DO something (that might take a lot of complaining) because your ping times should NOT be that high. You deserve better service for the prices Comcast charge. At work. Will try from home later. Note the bandwidth disclaimer. I can tell when a bolus of students has escaped class because the connection will grind to a halt. Strange. I got a B* with a ping of 21ms and jitter of 2ms. That is better numbers than some people with an A. Also, the ping server is colo'ed at my ISP. That means the test is not 'my internet speed', but rather 'my first hop speed'. That said, the graphics are pretty. People like pretty graphics. I distracts from the meaning of the numbers. MMKK: In all fairness to Comcast, I did downgrade our Internet to the lowest level so we pay a lesser price. Our total bill right now is $51.24 - basic cable and basic Internet. What can I say? I'm cheap! I pay less than that for my cable, and I live in (just outside of, though the the prices in the city are the same) the 7th most expensive city in the world to live in. deleted work ping test as it showed where I work.